COLD START: Temperatures are below freezing over north and central Alabama this morning, but the sky is finally clearing, and with ample sunshine we project a high in the mid 50s this afternoon, back to average temperatures for mid-January in Alabama. Clouds return to the state Thursday, and a few showers are likely Thursday afternoon and night as a weather disturbance passes through. Moisture will be limited, and rain amounts should be on the light side, generally less than one-half inch. The high Thursday afternoon will be in the low 50s. FRIDAY/SATURDAY: Friday will be a mild day, with a high in the mid 60s; the sky will feature more clouds than sun, but we are not expecting much rain. Then, on Saturday, a dynamic weather system arrives with a good chance of rain. While a few showers are possible Saturday morning, most of the rain will come from noon until midnight. While some thunder is certainly possible, for now we are not expecting any severe thunderstorms because of limited surface-based instability. Rain amounts will be around 1 inch, and the high will be in the mid 60s. 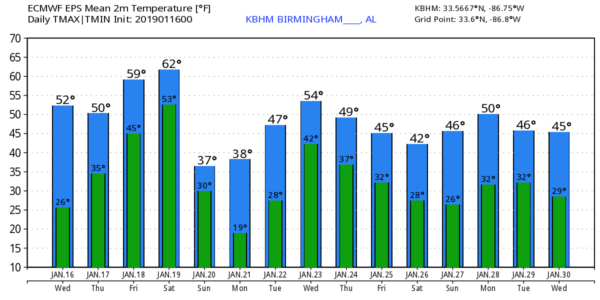 MUCH COLDER SUNDAY/MONDAY: Rain ends late Saturday night, and the coldest air so far this season blows into Alabama Sunday with a brisk north wind of 15-25 mph. While we have a decent chance of the sun breaking through by afternoon, temperatures will hold in the 30s all day, with wind chill index values below freezing. A few light snow flurries are possible over the northern third of Alabama early Sunday morning as the cold air arrives, but we expect no accumulation or impact. The incoming cold air is the big story. Monday morning the sky will be clear and the wind light; temperatures will drop into the 15- to 25-degree range over north Alabama, with a freeze all the way down to the Gulf Coast. REST OF NEXT WEEK: Another system will bring rain to the state later in the week, but there are huge model differences. For now we will side with the slower European model solution, with rain most likely Wednesday into Thursday. Then, another shot of cold, Arctic air arrives on Friday.